Have I mentioned how much we just love our new neighborhood? All the neighbors are so friendly and social and it has such a community and look out for each other feel. Well Sunday afternoon we found a Halloween bucket on our front porch filled with a few goodies and a note that said You Have Been BOO-ed! It contained instructions to place a part of the sign on our door stating we had been BOO-ed and how to BOO two other households. This is somewhat similar to a Secret Santa. 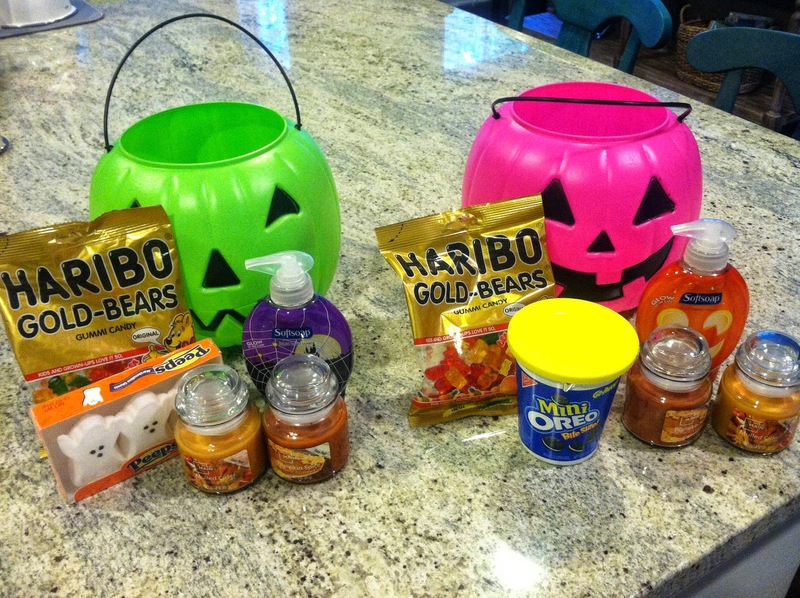 So during the weekly grocery store run, I picked up some things for two BOO baskets and printed off two more notes. This is the website with BOO notes and signs and all the instructions to start a Halloween BOO in your neighborhood or workplace. Here are my two BOO baskets. I filled them with candy, candles and glow in the dark halloween soap. How fun right?! I was at Walmart but the Target dollar spot would be a great place to find items too. The secretive part makes it more fun as I am wondering who left us our BOO Basket and those we gave ours to are probably wondering the same thing! It spread really really fast... we really had to look hard to see which houses didn't have a We've been BOOed sign already. Now when I drive through the neighborhood nearly every house has a sign so everyone really got into the Halloween spirit and the gift giving! It's just another thing I'm thankful for that we ended up living in such a great area. Hope you get BOO-ed this Halloween!